The happiest day for couples should take place in one of the most tranquil places in the Florida Keys. Islamorada! There are truly are no weddings like those that take place here in Islamorada. The beautiful pristine beaches and turquoise waters make a perfect setting for you to exchange your vows. There are numerous places of worship throughout Islamorada to accommodate people of all faiths. There are also many private homes, sailboats, and catamarans that provide wedding ceremony services for a beautiful wedding event right on the water. Along with great ceremony venues, there are also endless options for reception locations. The wide array of ballrooms, guesthouses, restaurants and resorts, and also historic properties which are perfect for garden weddings and are famous for their beautiful tropical flowers and trees. 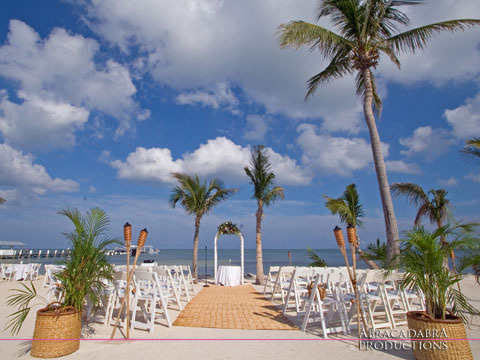 Additionally, there are wonderful Islamorada venues for beach weddings and hotels and resorts that will make selecting a reception location not only a delight, but a breeze as well. Consult your Islamorada wedding planner for details and availability. Destination weddings are now more than ever very popular and laid-back Islamorada has all the professional wedding services and supplies that you will need to make your special day absolutely perfect. There are numerous florists, bakeries, Key West wedding photographers, and wedding coordinators available to assist you in your wedding needs. And don’t forget the Islamorada wedding officiant who will be happy to help with most everything, even your Florida wedding license! Your already in getting married in Islamorada, why not stay and enjoy a wonderful Florida Keys Honeymoon! There are endless resorts, hotels, inns, bed and breakfasts to choose from and all are only minutes away from galleries, museums, charming restaurants, fabulous beaches and snorkeling on North America’s only living coral reef! What’s even better is our weather. It’s beautiful here all year round! Be sure to capture it with Florida Keys wedding video. There are excellant professional Islamorada wedding videographers in Islamorada. ConchTV is the most complete and easiest to use wedding guide for Islamorada and the Florida Keys. ConchTV provides the largest selection of Islamorada and Florida Keys wedding information anywhere! You’ll find info about Guest Accommodations, Wedding Coordinators, Wedding Cakes, Wedding Entertainment, Wedding DJ, Wedding Locations, Florists, Wedding Officiants, Wedding Photographer, Wedding Planner, Restaurants, Wedding Services and Supplies, Wedding Videographer and more!